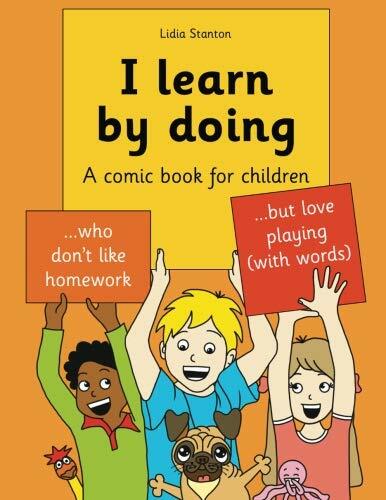 This funny comic book is a take on a ‘whodunnit’ story and a platform for introducing children to multisensory strategies for learning spellings, directions, days of the week, months of the year and other sequences that have to be recalled in order. Children (aged 6-10) can read the book independently or with the help of an adult (through paired reading). Additional explanatory pages (“Did you know?” and “Things you can try out”) assist the child and their helper at home in understanding what multisensory learning is and why it works. Practical suggestions extend to difficult homework situations – in which many children often feel frustrated – to enable them to experience success and enjoy learning at home. “I am Luke”, I say to them, “I learn by doing”. Luke discovers that his dog, Mr Pug, is a wizard. Mr Pug shows Luke how to remember ‘hard school things’ and helps him learn tricky spellings. Things take an unexpected turn when Sophie visits Luke and her bag of wooden letters goes missing. Luke learns that it takes more than Mr Pug’s magic to save the day.